Receive performance is on a whole new level from narrow bandwidth roofing filters that only full down conversion can provide. The TS-890S uses 8.248MHz 1st IF frequency down conversion for its receive signal system in order to continue the adjacent interference signal exclusion legacy refined in the TS-990S. This means you can use narrow bandwidth crystal filters with passband widths of 500Hz or 270Hz (optional YG-82CN-1) as roofing filters to achieve strong exclusion of unnecessary adjacent signals. The 1st mixer is the H-mode mixer also carried by the TS-990S. Conversion characteristics have been improved with fine-tuning of input/output matching as well the device used. 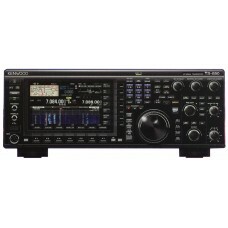 Kenwood say this radio delivers top-class receive performance with the following specifications. 110dB* 3rd intermodulation dynamic range (3rd IMDR) measured under punishing 2kHz spacing conditions. 114dB* reciprocal mixing dynamic range (RMDR). Kenwood uses a well known and highly acclaimed concept known as 'H mode' mixer. This mixer works with 4 very fast digital switches in an "H" arrangement (hence the name). One reason why this circuit has rarely been used so far is the relatively high requirements for the transformers. In order to avoid reciprocal influence and unwanted mixing products in the best possible way, an correct impedance-matched adaptation with three transformers developed especially for this purpose is required. Kenwood has not shied away from this effort with the mixer. Additionally, in order to make good use of this excellent mixer, an LO with low phase noise is also necessary. Here the manufacturer uses the proven concept of the flagship "TS-990S" with the HMC829 chip. The downstream standard roofing filters do the rest to achieve the best dynamic range values: 110 dB 3rd Order IMDR, 114 dB for RMDR and 150 dB BDR, measured at a distance of 2 kHz! This should ensure the TS-890S a top position in the usual lists. The advantage for the user is an intermodulation-free reception and outstanding large signal handling capabilities, even under the most difficult conditions. The digital technology following the filters works with two very powerful DSPs, which are clocked at over 300 MHz. More than enough computing power is available to perfectly control the AGC, but also to realize AF filters (notch, peak, noise, etc.). The result for the ambitious radio amateur are many adjustment possibilities to improve the received signal. Parallel to the receiver described above, there is also a second digital receiver with 14-bit AD converter, which displays the waterfall diagram on the 7" display. Up to 500 kHz spectrum width can be displayed here. Due to this independent receiver, the speed of the display of the waterfall is very high and also unaffected by the other settings. A multitude of very innovative ideas facilitate the tuning by tapping on the touch-sensitive part of the display. This way, the waterfall diagram is also calculated in the areas not currently displayed and is immediately displayed in full when the display is moved. This does not create any gaps in the display. Another feature of TS-990 has also been adopted, namely the display of filters with LF spectrum, notch position and much more. The large S-meter can be switched by tapping it in various displays. The excellent user interface of the TS-890S is based on Kenwood's 70 years of experience. Even complex functions are easy to operate, thanks to the large 7" display with softkeys and numerous classic controls. The hunt for the rare DX station is made much easier by quickly accessible split settings. Built-in decoders for telegraphy, RTTY and PSK31/63 are available, and if you connect a USB keyboard you can also use these modes without a computer on the transmitter side. For each operating mode, three different IF filter widths can be quickly switched via a separate button. And if you miss a second VFO knob you can connect your existing TS-590S (after a firmware update) as a second receiver to the TS-890S! Many rear ports are available for external devices, including a USB interface that provides a complete sound card interface (CAT control, audio input/output). The same functions are also available on the LAN connection (Ethernet). Thus, the TS-890S can also be used as a remote station without a computer provided. This simplifies station setup considerably and also reduces power consumption! The internal 1 GB memory of the transceiver is available for recording a received signal, but you can also use a USB stick as external memory.